Now an even better USB Charger/Tamper-Resistant Receptacle. 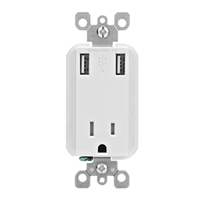 Leviton's USB Charger/Tamper-Resistant Receptacle offers a ground-breaking 2.1A of charging power and a 15A/125V Tamper-Resistant Receptacle. For the ultimate in convenience, this state-of-the-art device has the capability to charge up to two USB powered electronic devices simultaneously utilizing the USB Ports, leaving the receptacle free for additional power needs. The USB Ports, Type A, 2.0/3.0, are controlled by a smart chip which recognizes and optimizes the charging power of your device. *USB Ports are not intended to charge two tablets simultaneously.